Noel Baldacchino (right) holds the trophy after the Gold Class final. Quito De Neret, under the charge of Noel Baldacchino, took centre-stage during yesterday’s seventh meeting of the year after winning the Assikura Championship final for Gold Class trotters on a short distance of 2,140m. The programme consisted of eight races, all for trotters, and it was a memorable one for Baldacchino who ended the afternoon as the best driver with four wins. Nine horses lined up for the final and Starfirefinnfemfel (Julian Farrugia) set the early pace, opening a marginal lead over favourite Quito De Neret and Quel Homme (Rodney Gatt). However, with 1,000m to go, Quito De Neret started to dash strongly from the outside and eventually stormed clear of the field before sealing its third consecutive win. At the post, the winner was a half-length ahead of Quel Imprevu (Carmelo Micallef), Cowboy Party (Chris Cassar) and Wies Buitenzorg (Eric Bezzina). Quito De Neret registered an average time of 1.16.3” per kilometre. After the race, Andrew Grech, on behalf of the sponsors, presented the winning trophy to Baldacchino and Quito De Neret owners Simon and Cikku Borg. Another event that attracted interest yesterday was the Premier race on a long distance of 2,640m. 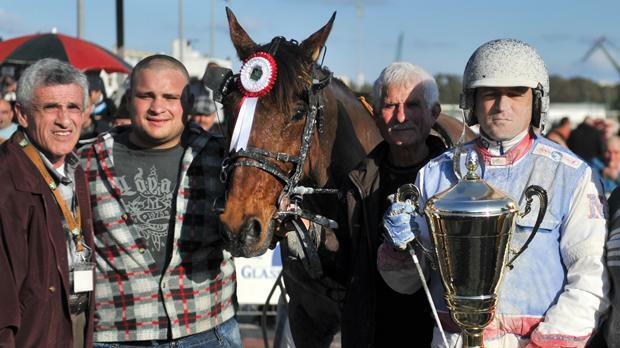 Again, Baldacchino did well to steer his trotter to first place. Fourteen horses took part as French newcomer Quad Censerie (Noel Baldacchino) upped its pace significantly to take the lead some 600m from the end. Quad Censerie went on to secure its first win at Marsa, a clear two lengths ahead of Quoberna-dor (Matthew Sammut) and Shakira Trot (Nathaniel Barbara). Wiss Roadrunner (Mario Farrugia) was fourth. Meanwhile, Johan Axisa was confirmed as the best driver for November 2014. During that particular period, Axisa won three Premier Class races at Marsa with Pedro Vici. Malta Racing Club official Fidel Dalli presented Axisa with a commemorative plaque.